Last edited by BWD on Wed Apr 05, 2017 1:12 pm, edited 2 times in total. Looks cool, interesting to see the appearance of the exrados. Is the max thickness swept far back at the tips? How does the foil shape vary across the span? But sounds he knows what he is doing, so hope he stays tuned to it and will be successful. IMHO don't even expect the scubajet is powerful enough, maybe to keep riding with minimum speed on a good foil if you're light but not more. But a propulsion and also the tube around wont replace a stabi from its effect. Even worse a bad controlled propulsion will make foiling even more difficult than a kite in gusty conditions. A kite has a great stabilizing effect. Just to take both hands of the bar on a monofoil is not easy, just check in my video how fast I take the hands back. And I am sure I wouldn't be able to use a monofoil without kite, it would be like coasting (foot of) on a extra high unicycle, never seen. How about a forward swept mono wing? Hmmm interesting, it will have more vortex drag and tip stall easy, but if the tips has higher aoi (and it overall has higher AR as otherwise the vortex will counteract the higher aoi), it would stabilize the wing just like a swept wing with washout (less aoi at the tips) is stable. OR, one could use an "S" profile with positive pitching moment, on a more straight wing (a stable wing, no need for a stabilizer). When the speed increases, there would be greater lift, causing twist which should increase the angle of attack of the tips, generating even more lift? Not really, as we are talking about stiff glass or carbon wings for hydrofoiling, so not the same "classic" aircraft issues. Tipstall is probably not the same problem as in flight either, for hydrofoiling - so the forward sweep could be tried yes, to see if possible to get working. Otherwise a more straight wing with an S profile (being self stable) as said, would definitely work, having a wide chord at the centre for the mast to attach so you dont need a fuselage at all. Could you put this in a simple picture, as example? Isn't yaw stability the main concern? It seems like a balance between mast and tip vortices would influence the center the monofoil rotates around in yaw. Wouldn't a straighter wing shorten the longitudinal distance between these and make yaw control harder? Wouldn't a forward swept wing have a problem with the yaw center moving abruptly when the upper tip breaches the surface? It seems like the aft swept example pictured is a more practical platform. The use of "S" or reflex profile seems viable. 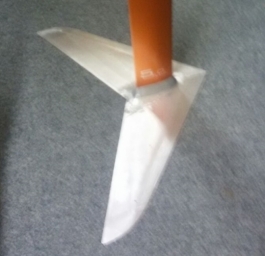 The picture of the swept foil seems to suggest there is no reflex at the tips, though, rather a washout or maybe an aft-shifted maximum thickness. Intuitively it would seem the place for reflex would be near the strut, where the chord affords plenty of area and the reflex might help mitigate turbulence around the strut to wing joint (although this area on the pictured foil doesn't appear to be so refined). The last time I went back on the mono and had some great sessions. Once I managed to enter a tiny bay, with very difficult low wind conditions. So also here there are no limits for the mono. But much more important after too much waiting time I was able to ride the new Cruizer wing. A friend with 100 kg tried it in the shown combination with the very difficult 94 x 38 cm board. (I have straps on the board to make it easier to find the right side to put the feet, as with the cruizer, which is nearly as big as the board, it could easily be inverted. = the Cruizer does not feel much more pich stable, on the other hand speed log shows another truth for higher speeds, so at least it has to be bit better. - and finally did 3 full flying tacks on one side, ... on the end had the feeling flying tacks are easier as you have to change less technic compared to flying jibes. Unfortunately the wind drops when I wanted to do a video from the manoeuvres. Oh and the back flips are just great, easily to do them agressivly with the foil far above the head out of slow riding speed and to land them always on the wing without touching. So I think I will keep the Cruizer but maybe also the Element. But if you just have the Element, no problem it is not much more difficult, just the minimum speed is higher and therefore you will need a bigger board which is always better. So who is world monofoiler Nr. 4 ?